Tybee Island is an island and a present-day city in Chatham County, Georgia near the city of Savannah. As of the 2000 census, the city population was 3,392. The island, which includes the city of the same name, had a population of 3,713. Tybee Island may be best known outside of Georgia as the home of the Tybee Bomb, a nuclear weapon that was lost offshore on February 5, 1958. Officially renamed "Savannah Beach" in a publicity move at the end of the 1950s, the city of Tybee Island has since reverted to its original name (although maps show the use of the name "Savannah Beach" as far back as 1952 and as recently as the mid-1970s on official state maps). The small island, which has long been a quiet getaway for the residents of Savannah, has become a popular vacation spot with tourists from outside the Savannah metropolitan area." - from Wikipedia: en.wikipedia.org/wiki/Tybee_Island. 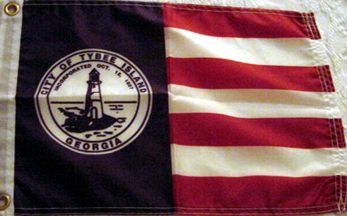 The current city flag is shown on a photo on the municipal website: www.cityoftybee.org (no longer accessible), and further below as an animated flag. It is blue with the seal on it. Here is webpage about the former flag of the City of Tybee Island, Georgia, USA: annettebergman.com/Tybeeflag.htm. "Frankie Soloman, who works for the City of Tybee in the Recreation Department, designed the flag. Frankie had the idea many years ago and until just recently it was only a dream. The flag has seven(7) stripes and represent the seven (7) flags that have flown over Tybee - American, Georgia, Confederate, English, Pirate, Spanish and French. The Blue represents "tranquility on Tybee." The flag was sewn by Annette Bergman, and she was known as the Betsy Ross of Tybee Island.